Grooved architrave is becoming increasingly popular in the UK- particularly in modern style interiors or new build properties. Unlike some other designs, the grooved architrave can be cut in such a way as to allow the groove(s) to align perfectly with the groove in a skirting board of the same design. This mean the groove can become one continuous feature around the perimeter of the floors and doors. To achieve this look it is important to purchase skirting boards and architrave at the same thickness, and install onto walls that are in good condition and level. 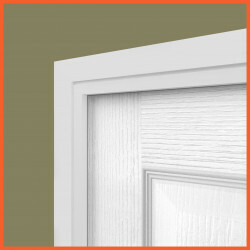 As with the same style of skirting, grooved architrave needs to be primed and painted carefully. It can be difficult to get a good paint coverage inside the groove with a brush, but as the architrave is at eye level any imperfections in the finish will be very apparent. We offer both a priming and fully painted service that takes the hard work of painting the architrave groove away from you. We hand spray both primer and a top coat of satin or gloss paint so that your architrave arrives with a high quality finish and ready to install. You can opt for this service by selecting the relevant finish from the drop down menu within the product page of your chosen design. 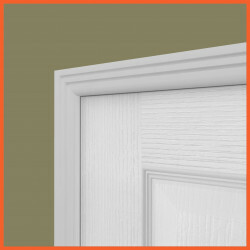 Our Bullnose Groove 2 architrave is a modern take on the classic Bullnose design. The addition of the double groove creates an additional level of detail and elevates a fairly standard profile to a more contemporary, individualistic design. Like with most grooved profiles, the bullnose groove 2 is a great addition to a modern interior.